One of the benefits of living in the city, is that my kids are exposed to many different types of restaurants. Much to my surprise, one of their favourites is Wagamamas. I too love it, and it feels a little less kiddish than some of the other chains, so we’ve been quite a bit as a family. Their favourite dish is the mini chicken ramen. It is so tasty but actually looks relatively easy to cook. 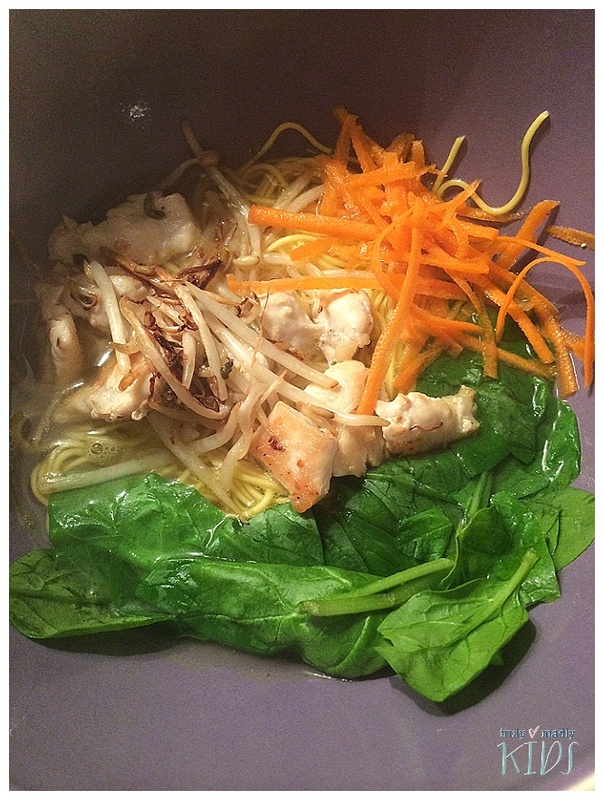 I googled it after a trip there, and I was delighted to see that the website has a recipes section – I adapted their ramen recipe for my kid’s taste buds and I was quite pleased with the results! 4. Add in your greens and veg, and also simmer for a minute. When I asked my kids how it was, my daughter replied it was lovely wintery supper as it was so warm and filling. So, we have added to the list of acceptable teas in our house! Give it a try and let us know how your kids liked it!